The popular show is now a great game! 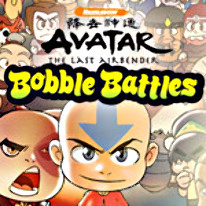 The Avatar cartoon series has become a great new game, Avatar Bobble Battles! From the attack on the Northern Water Tribe to the siege of Ba Sing Se, it's up to you to decide the outcome of your favorite battles as you command the armies of the Water Tribe, Earth Kingdom, and even the Fire Nation in this unique strategy game! Avatar Bobble Battles is strategic fun for everyone in the family.